Powerful SUVs over 550 horsepowers have been on the rise, but at a hefty price. 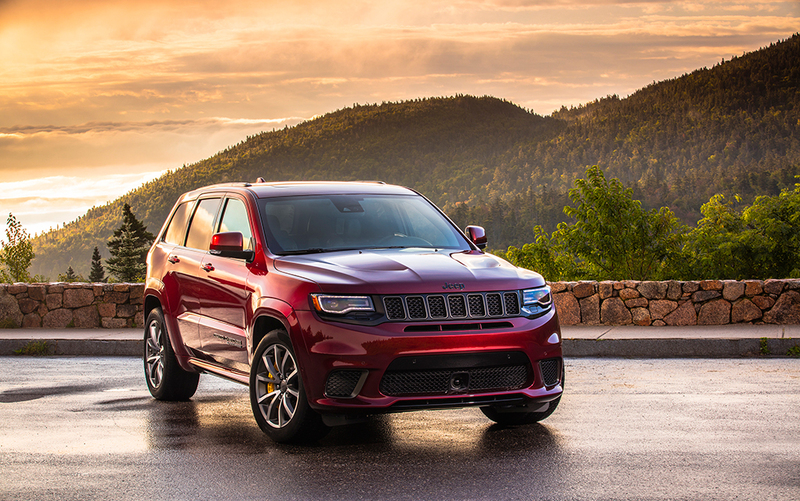 The 2018 Jeep Grand Cherokee Trackhawk packs more power and outruns the competition. Reaching 707 horsepower form a 6.2-liter supercharged Hellcat Hemi V8, it comes at a much lower price tag. At a base price around $85.000, it’s a lot of horses for average city speed limits under 35 mph. The 707 horsepower Hellcat Hemi V8 engine was first introduced in 2015 for the SRT Dodge Challenger and SRT Dodge Charger. The Charger sports sedan has a top speed of 204 mph and the Challenger is 199 mph. The 2018 Jeep Grand Cherokee Trackhawk, for those who seek power and adrenaline from an SUV. Jeep borrowed the engine power from FCA?s performance division and added its own brand of technology. The Trackhawk has a launch control function that helps maintain a straight-line during acceleration by synchroniz-ing the engine, transmission, driveline, and suspension. The four-wheel drive system shifts power to the rear for more power, while keeping all four wheels on the road. The Trackhawk rides on 20 by 10-inch forged pol- ished wheels with BSW all season tires. Standard interior features include Connect navigation with an 8.4-inch display, Apple CarPlay and Android Auto, 9 amplified speakers with subwoofer, eight-way driver and passenger seats with memory. Options in the test vehicle included two rear displays with blu-ray DVD players, a dual-pane panoramic sunroof, leather performance seats, and Harmon Kardon speakers with subwoofer and an 825-watt amplifier. Base price is $85,900. Price as tested $99,965.